A ski reality TV show, that’s my daughter view of our ski trips…“Ski travels with the Burke family” would be highly scenic, a bit hectic and therefore humorous, with plenty of action packed skiing. For our pilot we could premier our family ski trip to western Canada. Our family ski adventure would star spectacular footage of snow-capped Rocky Mountains, skiing four famous resorts in eight days, hopping from one extraordinary hotel to the next. Watch us repeatedly cram our gear into our mid-size rental, like clowns in a Volkswagen, for our scenic TransCanada drive from Calgary to Banff Lake Louise, to Jasper in Alberta, then Panorama in British Columbia. Along the way we encounter some very cool Canadians (wearing tuques, eh). No one was hurt, that could be bad for ratings, but my husband squared off with a big horn sheep and we were all frisked by Canadian Royal Mounties as we were escorted out of the country. Until our ski series gets picked up by Bravo, MTV or HBO you have to read about our Game of Skiing, our travels and photos fer’ sure (I speak Canadian now eh!). Our premier opens at Sunshine. To get to our lodging, Sunshine Mountain Lodge is the only slopeside lodging in Banff National Park, we must ride a gondola. Of course we arrive too late (thank you airlines) despite my husband driving 140 kph (you do the math), so our gracious Albertan hosts deliver us to 7,200-feet via their Ford Excursion snowcat. Looking out at Sunshine’s jagged snow capped peaks from our loft’s floor to ceiling windows gives p romise of big mountain skiing the next day. 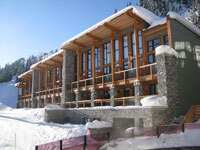 The newly redesigned hotel sports an enviro-friendly art deco mountain style. Native stones surround the oversized outdoor Jacuzzi, with views of Goat’s Eye extreme terrain and starry skies above. The intimate hotel has everything you need: a delightful staff, dining and game room, high thread linens and location, location, location. 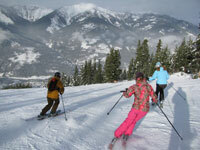 We are first skiing Sunshine’s 3,368-acres by sleeping on mountain. 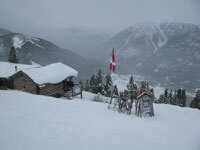 By noon we have skied three mountains, across the Continental Divide from Alberta to B.C. and back again. Sunshine proclaims “best snow in Canada” with its highest elevation (the resort only owns two snow guns), and I would add “best views” as you look out at countless peaks including the pinnacle Mount Assiniboine – the mini-Matterhorn of the Rockies. Episode I concludes as we hear rumors “the Dive is open.” Equipped with a guide, avalanche beacons and shovels, we dove into Delirium Dive – one of the steepest runs in Canada at 50-degrees. This is gated access, no fall, no faint of heart terrain. The deep natural snow and steep shots make me delirious – its namesake, eh. In Episode II we dog sled with burly bearded Uel, Yukon Cornelius’ cousin perhaps, and his herd of happy sle d dogs with Kingmik Dogsledding. 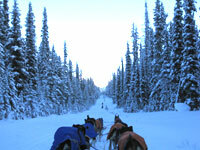 We strap into sleds for a classic Canadian adventure. My daughter pets and memorizes all her new four legged friends’ Dog Sledding names. My son is psyched to take the reins and drive the dog sled. My husband loves the photo ops and is impressed by the sheer power of nine sleek strong dogs. Me, I have tears in my eyes – not from the chill, but from the beauty as I am snug in a down sleeping bag in the narrow sled as we charge through the frosted Canadian forest. 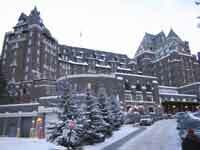 Episode III we arrive in the most magical setting, the famous Fairmont Chateau Lake Louise. This celebra ted hotel was dreamed up by Canadian Railroad entrepreneur Cornelius Van Horne in 1890. Chateau Lake LouisieVictoria Glacier plummets to a sparkling frozen lake with the grand castle Hotel perched on its shore. Guests skate amid huge ice sculptures and sleigh rides glide around the snowy Lake. Inside the immense Chateau is luxury and opulence; grand lobbies and lounges with picture windows frame the glacial scenery outside, and a harpist plays by a sparkling holiday tree – I am not making this up. Next morning at the grand Lodge of Ten Peaks at Lake Louise Ski Area, just a 10-minute shuttle from the Chateau, we get ready to ski. Riding three consecutive lifts we arrive at the top of the world, with extraordinary scenery and expansive ski terrain, 11` sq. miles. “If you can see it, you can ski it,” goes the local mantra. Exploring Lake Louise’s 4,200-acres we find everything from groomed front side cruisers (one was 5-miles long with 3,250’ vertical) to the steeps of World Cup where Bode and Lindsey competed earlier this season. 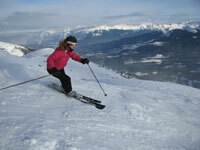 But the best of Lake Louise is off the 8,765’summit,reached by an expert’s only poma. The backside bowls of Whitehorn and Powder and ten others from my quick count easily hold a torch to Vail for extreme skiing. Our crazy Canadian guide points out that Jackson Hole’s ski patrol come here to train on the big steeps and chutes. A cozy lunch at the historic wood frame Temple Lodge on the backside of Lake Louise. Episode IV is something out of a Harry Potter film as we walk through mazes of stone archways leading to grand rooms with gorgeous views. Our one-night stay at The Banff Springs Hotel, elder-sister to the Château, built in 1888, is far too brief since it takes time just to find our room. The immense baronial castle hotel features 11 restaurants and lounges from fondue to samurai sushi, swank shops, and the most posh Willow Stream Spa with therapeutic minerals pools and cascading waterfalls in invigorating temperatures. Guests can walk to the town of Banff and ski Banff’s 3 resorts, Sunshine, Lake Louise and Norquay, or just bask in their good fortune by the fire. To conclude we feast at Banff’s Sleeping Buffalo, where the elk we saw roaming near town make their way to our plates at the Buffalo Mountain Lodge. Episode V Jasper is the largest National Park of the Rocky Mountains. No one asks “are we there yet” in our cramped three-hour car ride by miles of glaciers, gigantic peaks and acres of snow draped pines. I dub Alberta the land of a billion Christmas trees, and Greg says his fears of global warming are temporarily assuaged. Arriving at Jasper Park Lodge, our third Fairmont hotel, we do the touristy photos with the elk and bear (ok, stuffed) in the Grand Rocky Mountain lobby. From the posh window lined bar (where I would be content to sit and drink in the views and vino), we can see Marmot Basin where we will ski the next day. We quickly recognize that many families never leave the 700-acre resort, choosing instead to skate on Lake Beauvert, enjoy horse rides, kids programs, the swimming pool, elegant restaurants and just sit by the sumptuous fireplaces. The kids are ecstatic to get their own room; we are lodged in one of the out cabins that dot the property. We bundle up like Nanook from the North to walk back to the lodge for dinner. Its cold in Canada eh?! Episode VI has us Marmot laps on the longest, fastest high-speed quad in the Canadian Rockies. Marmot B asin just installed this lift, rising 2,000’ vertical from base to near the summit. Marmot’s snow was amusingly squeaky and dry – due to its northern location and 8,570’ summit. After cruising the lower mountain’s progression from greens to black, we venture up the summit Knob Chair to find expansive snow bowls. Marmot reminds me of Loveland Colorado with its above tree line bowls, only with less skiers amid the 1,675 acres and far more stunning peaks. After our exhilarating day skiing Marmot, we pass elk grazing lazily by the roadside in the funky frontier town of Jasper. The marmots must be hibernating. Episode VII opens with big horn sheep standing in the road on our way thru our next park, The Kooten ay National Forest of inner British Columbia. We are all a bit punchy pulling into our fourth ski resort, Panorama. An Intrawest resort since 1994, Panorama is the perfect place for our finale, a well-planned condo resort with outdoor pools, shops, and restaurants all within walking distance so we can kiss our car goodbye for a few days in the underground parking. Panorama is far more condensed and boutiquey than sisters Whistler or Tremblant but the mountain offers up a huge 4,265’ vertical with expansive groomed resort skiing. We also find some adventuresome off piste terrain in Founders Ridge and Taynton Bowl, this terrain in the Purcell Mountains was previously accessed only by heli-skiing. Lunch at the mid mountain Elkhorn Lodge delivers delicious homemade fare, trumped only by fantastic views and the host family’s history in this cozy 1952 cabin. Don Bilodeau’s bear story had the hairs on our collective necks on end. Skiing seemed tame after that. Ending our Panorama scene, we enjoy a sophisticated evening at Earl Gray Lodge, the “prix fixed” chef’s dinner followed by resort fireworks was fantastic. 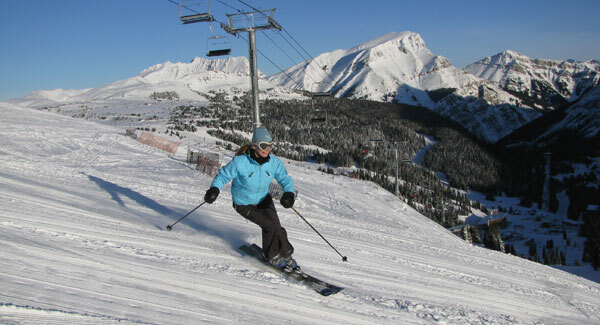 After skiing four famous Canadian Rocky ski resorts and lodging at equally impressive properties, our family loved the setting of Sunshine, the terrain of Lake Louise, the light fluffy snow of Marmot Basin and the resort village of Panorama. Since you can’t combine these Canadian qualities into one, and our travels are yet to be televised, I recommend you visit them all for their remarkable beauty. Alberta claims to be “the sunniest province,” and I would add “the friendliest”. The Canadian Royal Mounties made our full body search at the Calgary Airport pleasant, eh? !